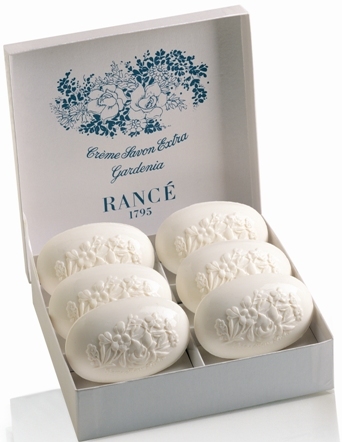 Rance Gardenia Soap is buttery rich and floral but it has been modified here to be a very soft and subtle tone. As with all Rance Soap, each of these is hand-made, hand-wrapped and made in Italy. An very much appreciated gift! A gardenia flower is embossed on each bar. Rance Gardenia soap is my favorite. I was hesitant at first to order from TheSoapBar, but found out when ordering that they are a Google Trusted site. The soaps shipped within hours of my order, were well packed, and arrived on time. I was excited to try Josephine and Olio di Rose. Both smell great, but Gardenia is still my favorite. I will be ordering from here again.